Safety Pressure Switches | Pressure Sensors | Pressure Switches - Chase Controls, Inc.
K-Dyne offers both pneumatic and electropneumatic safety pressure switches. The pneumatic Model P40 can monitor pressures between 10 and 10,000 PSI. 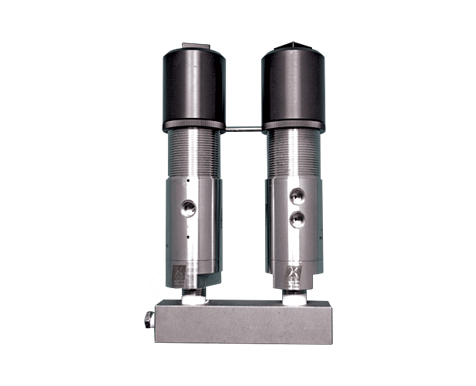 It functions as a 3-way “block and bleed” valve that can be configured to respond to increasing or decreasing process pressures. Pressure ranges may be made by simply moving an internal piston and or changing spring tensions. The electropneumatic “E-Stick” safety pressure switch utilizes a Murphy pressure switch which is available in several pressure ranges. The advantage of this design is the pressure setting can be easily changed by moving the indicator on the dial of the switch. The unit is powered by a 12 volt battery.